This is the second part of a blog post about a study visit to Cape Town, South Africa. It is the third article in a series of reports and blog posts on Dealing with the Past in History Education. The first part of this blog post is available here. For more information about the project, visit the project page: Dealing with the Past in History Education. Case Study 3 on Discrimination and Racism is a good example of the tools given to teachers on how to deal with a possibly uncomfortable situation in their classroom. In this example the black students felt that the coloured students did not want to interact with them because they believed the coloured students saw them as “lower class.” The next part of the curriculum goes through what the school and teacher did to rectify this problem, how the students responded to the teacher’s actions, and ends with reflections on the overall issue. The many case studies in the training provide specific scenarios for new and experienced teachers to work through how best to deal with similar issues that might arise in their own classrooms. This allows the teachers who go through the training to learn, discuss, and debate best practices in dealing with these issues that have their roots in South Africa’s apartheid past. It is by leaning and using these tools that help teachers confront and effectively deal with these issues in constructive ways with their students. In the conclusion of the “Classrooms of Hope” it states, “We spend a lot of energy trying to ensure that learners leave school as respectful, compassionate and non-racist democratic citizens. Much of the responsibility of this falls on teachers.” This is why teacher Professional Development is one of the key components to successfully being able to answer our core question on history education’s role in dealing with a difficult past. Before you teach the history, you must ensure the teachers are well-equipped with the skills, knowledge, and awareness to successfully teach this difficult and recent history. 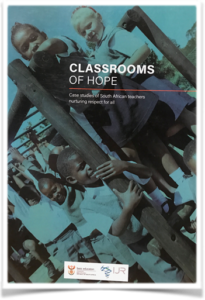 When talking with Dylan Wray, the author of “Classrooms of Hope” and executive director of Shikaya, he laid out the sobering reality of eduction in South Africa as well as teaching history in South Africa. According to Dylan, South Africa graduates 600,000 students annually, but a staggering 1 million students drop out of school before even graduating. Thus, the impact that history education can have on the overall populous is hampered with the large amount of drop-outs who will never receive the history education they so desperately need. Compounding this problem is the lack of importance placed on history education overall in South Africa’s schools. According to Dylan, history is not a compulsory course in high school but rather an elective course students can opt to take or not take. Dylan bluntly stated, “History is not seen as an important subject. It will not get you a job.” Cecyl Esau, said, “There is a dwindling number of people taking history. How is the younger generation going to learn about the past if the emphasis is only on science, math, and technology?” Therefore, improving the status of history education is just one of the several challenges Dylan, Cecyl, and others are facing in being able to teach all South Africans about their difficult past. Paola Mwamba followed up Kyle’s comment with, “Not all parents got the education. We come to school we are working and talking with different races. But it is much easier for us than our parents.” The students’ present is much different than their parents’ past. For students like Kyle and Paola, the future of South Africa is one of promise and hope. 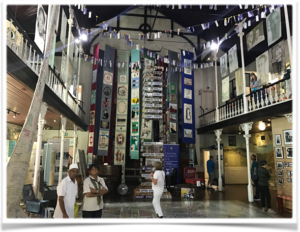 On the last day of our visit to South Africa we visited the District Six Museum. District Six was a residential neighborhood in Cape Town that was designated as an all-white area in the 1970s by the South African apartheid government. This meant that its over 60,000 mostly black residents were forcibly removed from their homes. This traumatic and disgusting event of South Africa’s history is chronicled and memorialized at the District Six Museum. Mandy Sanger, the museum’s Education Manager, said, “We work with memory in the present. In the present we help people understand how the present is explained by the past. It is nothing natural [as in a natural disaster changing the demographics].” What happened to the people of District Six shows the true inhumanity and cruelty that was apartheid. It is the hope of the museum to have as many school groups visit the museum and participate in its workshops where students confront this difficult history. The museum struggles with funding and staffing issues. It cannot afford to bring many students from the most disadvantaged schools to the museum, and if they did have the funding for the students, they would need additional funding to have enough staff to run the workshops as well as the museum. For now most of the school groups who are fortunate enough to visit the museum are from the more affluent schools, which have the funding for such field trips. According to Mandy, some of the students at these schools are resistant to participating in the workshops. The reality is that for some of these students the past is too painful to face. Facing the country’s history as a white South African can be quite difficult, because it can be one of shame and guilt. However, it is with workshops like the ones at District Six and the programs promoted by the IJR and Shikaya that are critical for South Africa to be able to face its difficult past and create an inclusive future for all South Africans. It has been less than thirty years since the end of apartheid in South Africa, and real change is difficult to achieve in any society. With time and the continued efforts of the courageous people we were fortunate enough to meet and talk with, South Africa has the people, the knowledge, and the dedication to truly become the rainbow nation for all of its people. The last morning, Frank, with his smiling face, is there to pick me up from my hotel to give me a ride to the airport. In the course of my conversations with Frank, I have learned that he has been in South Africa for a little less than twenty years, coming after the end of apartheid from the Republic of Congo. He is married to a South African woman, and they just had their third child two weeks prior to my visit. He sees South Africa as a country of opportunity, a place to make a better living than his native city of Brazzaville, Congo. He owns his own tour company, and he has high hopes and dreams for his future and his children’s future in South Africa. South Africa, as he tells me, has been “very good” to him. It is right about this time in our conversation, as we are nearing the airport, that Frank stops talking about his future and his family. He points to his left to show me the slums. He said, “This is very sad.” He was right. Seeing the slums for the first time was a bit of a reality check for me. I had arrived a few days earlier at night and did not see the slums. I had spent a day touring the Cape, seeing the beautiful coast and driving through some of South Africa’s more affluent neighborhoods. I had spent the last few days in downtown Cape Town, a bustling metropolitan city like many others I had been in before, but this was my first exposure to seeing people living in slums. My kids go to schools where there is a very good racial mix. My one child is taught by a woman who is a coloured lady. We live in a South Africa where there are protests, and it is legal. We have a judiciary that really works. My kids are raised today still going to a wealthy school, so their friendships are class-wise the same. Dylan, also explained how South Africa has not changed enough. The lady that cleans our house. The gardener that comes twice a week from Mali. The grounds staff… Their (his children’s) interactions of power (with black people) were the same that I had…The Geography hasn’t changed. Most black people (that my children interact with) are mainly serving you. 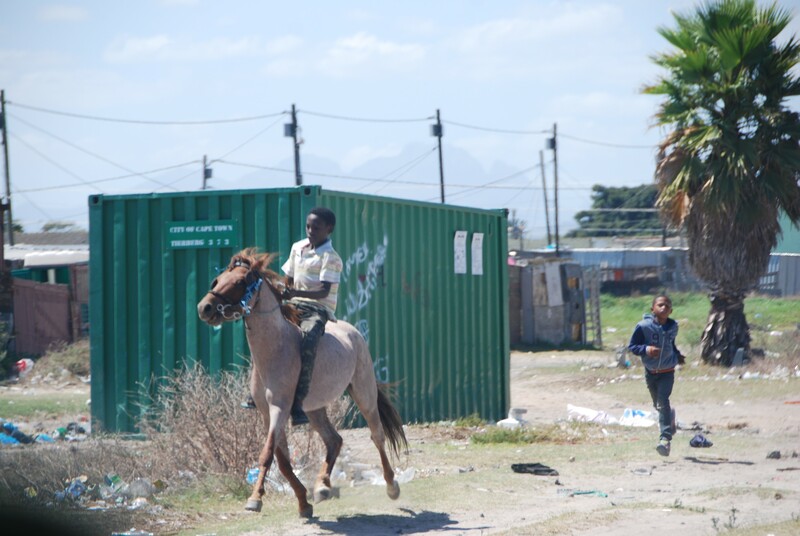 You can drive in Cape Town and back to the airport, leave from this wealth and you will see the shacks….it will look like it did during apartheid. So as I was getting ready to leave South Africa I was finally faced with its harsh reality: it is a developing country trying to come to grips with its discriminatory racial past while also faced with thousands of its citizens living in the depths of poverty. It is imperative for all South Africans to understand that the scares of apartheid are still very real and shocking. It makes the work of everyone I meet seem more relevant and important. This is the second part of a blog post about a study visit to Cape Town, South Africa. It is the third article in a series of reports and blog posts on Dealing with the Past in History Education. A report of the visit to South Africa, written by Khaled El Masri, is available here.